If you’re planning to invest in commercial real estate in the future, you’ve come to the right place. 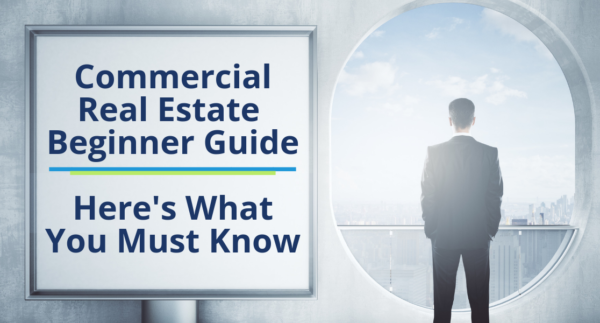 Our commercial real estate (CRE) guide for beginners will detail the important points you need to know about investing. Commercial real estate (CRE) offers many opportunities for savvy investors of all backgrounds. It serves as a great addition to any investment portfolio. Beware, like any other investment, investing in commercial real estate (CRE) comes with risk. Reduce risk and educate yourself with all aspects of commercial real estate before you begin. You must ask this question before you invest in commercial real estate. What goals and objectives are you seeking? For many investors the goal is to secure a steady return on invested capital. For other investors, it can be the significance of the property such as a historical building or landmark. Also, some investors pursue CRE for tax benefits and investment diversification. Before you purchase your first property, be sure to resolve your ambitions. Investopedia.com defines commercial real estate as “property used only for business purposes, and leased out to provide workspaces. Commercial real estate provides a location for companies and business owners to complete daily operations. It’s also used for serving customers. Companies that seek commercial real estate range from “mom and pop” stores, bakeries, car dealerships, to multi-million dollar corporations. Commercial properties falls into many sectors. Have a look below at the various categories and how they serve a commercial purpose. 1. Office Buildings: Office properties serve as workplaces for many companies. Companies use office spaces for call centers, meetings, medical/laboratory use and more. Two categories of office buildings are central business district, and suburban office buildings. Office buildings in the central business district are in the heart of a city, within a busy downtown area. Suburban office buildings are outside of a city center, or within a suburban office park, where there are several mid-rise buildings in a cohesive setting and ample parking. Office buildings classify into three classes: Class A, B, and C. These letter grades consider a property’s age, location, appreciation, amenities, rental income and more. These classifications give potential buyers or investors preliminary information on the building. 2. Retail Buildings: Retail properties serve as a location for business or companies to transact with customers. As discussed before, this ranges from small businesses to large businesses. Retail properties encompass various categories. Retail can include strip centers, community retail centers, power centers, regional malls, and out-parcel. 3. Industrial Buildings: Industrial properties provide spaces for companies to manufacture or store goods or products. Different categories of industrial range from heavy manufacturing, light assembly, flex warehouse, and bulk warehouse. 4. Multi-Family Buildings: Though residential, multi-family properties are considered commercial real estate once it’s larger than a fourplex. Different categories of multi-family properties include garden apartments, mid-rise apartments, and high-rise apartments. 5. Land: Different types of land include greenfield land, infield land, and brownfield land. Commercial real estate investing has many benefits. This venture can be rewarding both financially and personally. Here we look at three benefits of CRE. 1. Less Competition: due to its perceived difficulty and capital required for entry, commercial real estate investors are scarce compared to other investors. This leaves room for less competition and more opportunities. 2. Longer Leases: compared to residential real estate, commercial real estate has longer lease terms on average. While this is specific to tenants and individual properties, commercial property owners sign leases for many years on average. Longer lease agreements mean salacious returns and monthly cash flow. With a triple net lease, the commercial tenants pay the buildings taxes, insurance, and maintenance – meaning higher monthly returns. 3. Higher Income: the most known benefit of commercial real estate is its potential for higher income. Commercial properties have an average return on investment of six to twelve percent versus single-family homes. Single family homes average a one to four percent return on investment. Also, commercial properties provide a lower risk of vacancies due to having many available units. In smaller properties where there are less units the risk of vacancies are higher. As discussed prior, commercial lease terms last many years, meaning less tenant turnover. Investing in commercial real estate requires due diligence, regardless of the property type. The due diligence process is thorough and time-consuming. Due diligence divides into many phases where each phase investigates an aspect of the investment. 1. Preliminary Due Diligence: this stage occurs before signing an official offer in a binding contract. Preliminary due diligence involves property visits and discussions with advisors, such as attorneys. 2. Due Diligence: this phase occurs after signing an official contract. The purchaser or buyer arranges structural, engineering, building, and mechanical inspections. In the due diligence phase documents such as the deed, tenant leases, title, insurance, environmental assessments, and more are scrutinized. 3. Environmental Site Assessment (ESA): this is the last phase of the process. Environmental site assessments (ESAs) begin with a Phase I Environmental Report. A Phase II ESA only follows if there is contamination or other concerns raised in first phase. A thorough commercial real estate investment requires commitment and research. Hiring the right professionals is important to helping you during this process. Experts to consider are commercial real estate brokers, mortgage brokers, real estate attorneys, accountants, and inspectors. Depending on your investment these professionals will vary. Hiring these professionals are a costly investment, but failing to hire the right team will lead to major mistakes. The first step to buying commercial real estate is to determine whether you’re using an entity or LLC name, or purchasing as an individual. Majority of commercial properties are under an entity, corporation, or LLC. There are a few ways to purchase commercial real estate. Some investors are able to buy a property all-cash. This depends on the purchase price and the available capital of the investor. Other investors secure bank financing or a mortgage loan. Commercial loans differ from residential. The terms range from five to twenty years and commercial loans rely on an investor’s financial or credit history. The loan-to-value (LTV) ratio is an important factor for lenders when determining financing. The LTV is the value of a loan against the value of the property. The amount of the loan is then divided by the property’s purchase price. Commercial loans have a general loan-to-value (LTV) range from sixty-five to eighty percent. Commercial lenders also consider the Debt Service Coverage Ratio (DSCR). This factors the property’s ability to service a debt. The DSCR is the property’s net operating income (NOI) to it’s mortgage debt service, including principal and interest. Once you’ve decided your objectives and goals for investing in commercial real estate you’re ready to begin the process. Surround yourselves with the right professionals, study and research the investment property, and secure financing that’s appropriate for you. Is Commercial Real Estate a Good Investment?